“Yeah, we were dabbing all night, you should have come down. I picked up some skywalker wax and my buddy brought his new vape, we were so lit. How about you? We were at my place smoking flower. My brother had some moon rocks, we got so faded. Dabbing? Wax? Flower? Moon rocks? 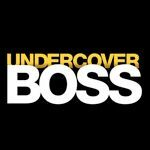 In this article we will review current trends in marijuana use, new forms of ingesting marijuana and its active chemicals, changes in marijuana slang and paraphernalia, and provide visual examples to assist employers in keeping these items out of the workplace. As marijuana continues to become decriminalized, more and more buying options are being offered to consumers. Unlike smoking marijuana, where cannabinoids enter the body through the lungs, edibles introduce cannabinoids through the gastrointestinal tract. As medical marijuana has grown in popularity, more and more buying options are being offered to consumers. 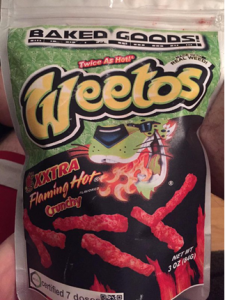 There are now marijuana-laced cookies, candies, chips, drinks, cereals, and even pizza. In the past, the most common slang names for marijuana-laced foods were “brownies” and “space cake.” Edibles present a unique challenge to employers, as employees can be sitting in the break room “getting high” in plain sight. Look for labels that mention dosage levels of THC in milligrams. Keep an eye out for look-alike brands, like the real example below: a popular brand of chips which has been parodied for edible marijuana-laced chips. Vaporizer pens are typically powered by a small battery that screws onto a tank or atomizer that contains a heating coil system. The vaporizer pen is then filled up with THC-containing wax or oil and when the button is pressed, the battery engages the coil and vapor is created, which is inhaled by the user (this is referred to as “vaping”). Cannabidiol (CBD) is one of at least 113 active cannabinoids identified in cannabis. It is a major phytocannabinoid. CBD is considered to have a wide scope of potential medical applications – due to clinical reports showing the lack of side effects, particularly a lack of psychoactivity (as is typically associated with ∆9-THC), and non-interference with several psychomotor learning and psychological functions. 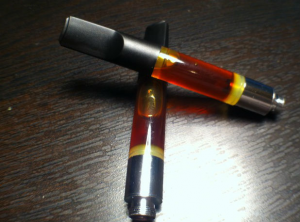 Vape pens have disposable cartridges containing CBD oils, some of which are flavored. This allows the user to purchase new cartridges without replacing the entire vaporizer. Keep an eye open for these in the employee parking lot. 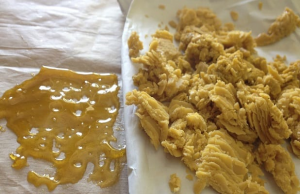 “Dabbing” is a new method for smoking marijuana concentrates that involves using either a blow torch or electric nail to heat the surface of an oil “rig” pipe or bong and pressing a cannabis concentrate such as hash oil against the heated surface, thereby creating a powerful smoke. A dab rigs looks like a glass bong but it is a specifically designed glass pipe for dabbing. 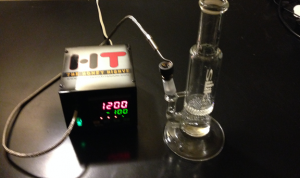 The biggest difference between a bong and a “dab rig” is the material that is smoked. A bong is used to smoke dry marijuana leaves and buds that are packed into a bowl and lit with a lighter. 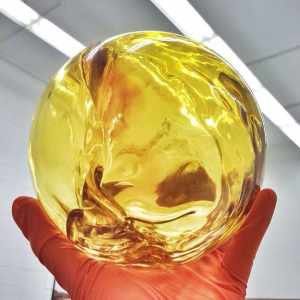 A dab rig is used to smoke oil, shatter, wax or other concentrates that are pressed against the bowl. The bowl is super hot, via connection to an electric nail or by heating with a handheld butane torch, which vaporizes the concentrate on contact, before it is inhaled. What do you “dab” in a “dab rig”? 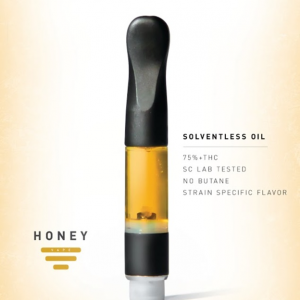 Cannabis concentrates: oils and waxes containing THC or CBD. 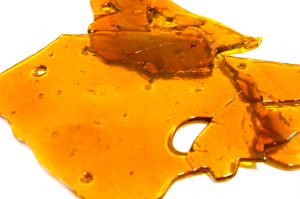 Hash oil is an oleoresin obtained by extraction from marijuana and/or hashish. Oils are usually packaged in folded paper because they are delicate and sticky. 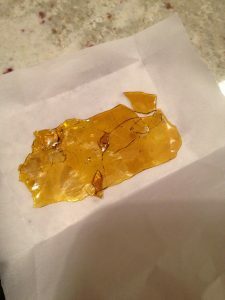 “Shatter” is a semi-translucent amber-colored extract. It is called “shatter because it resembles glass when broken into pieces for use. 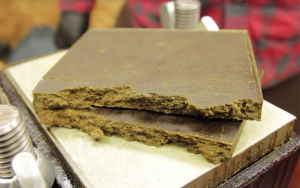 “Hash”, also called “hashish” is the resin collected from the flowers of the cannabis plant. The primary active substance is THC. 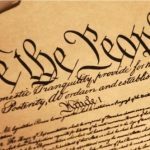 “Hash” has been smoked for centuries and was part of the 1960’s counter-culture in the U.S. 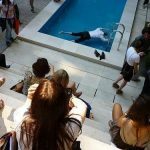 It is still popular and is now being mixed with marijuana and other drugs to create powerful concoctions. 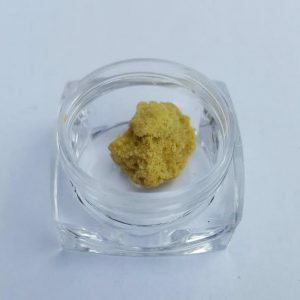 The slang term “Kief’ refers to resinous trichomes of cannabis that may accumulate in containers or be sifted from loose, dry cannabis flower with a mesh screen or sieve. 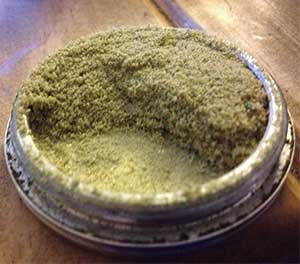 Kief usually comes from using a grinder to grind up marijuana and accumulates at the bottom of the grinder, beneath a mesh screen. 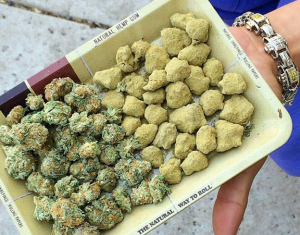 “Moon rocks” is marijuana that is coated in hash oil and then rolled in kief , creating a very strong and potent drug. They look like sand-coated balls or rocks. Hopefully these images and slang terms will help you identify drug abuse in the workplace and keep these items off your property.